Achieving the performance potential of an Exascale machine depends on realizing both operational efficiency and scalability in high performance computing applications. This requirement has motivated the emergence of several new programming models which emphasize fine and medium grain task parallelism in order to address the aggravating effects of asynchrony at scale. 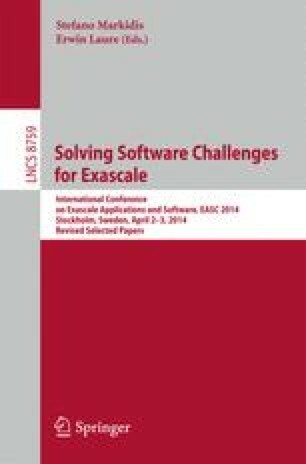 The performance modeling of Exascale systems for these programming models requires the development of fundamentally new approaches due to the demands of both scale and complexity. This work presents a performance modeling case study of the Livermore Unstructured Lagrangian Explicit Shock Hydrodynamics (LULESH) proxy application where the performance modeling approach has been incorporated directly into a runtime system with two modalities of operation: computation and performance modeling simulation. The runtime system exposes performance sensitivies and projects operation to larger scales while also realizing the benefits of removing global barriers and extracting more parallelism from LULESH. Comparisons between the computation and performance modeling simulation results are presented. The authors acknowledge Benjamin Martin, Jackson DeBuhr, Ezra Kissel, Luke D’Alessandro, and Martin Swany for their technical assistance.